If you remember moderate Republicans, you also remember green stamps and dial telephones. In the sixties, some Republicans even leaned into the liberal column. They included Mark Hatfield of Oregon, Jacob Javits of New York, and – for a period – Mayor John Lindsay of New York. Lindsay, eyeing a future presidential nomination, abruptly switched to the Democratic Party in 1971, announcing he had singlehandedly rescued the city from Republican misrule. What all these moderate liberals had in common is that they were called Rockefeller Republicans after Nelson Rockefeller, the four-term governor of New York and U.S. vice president. 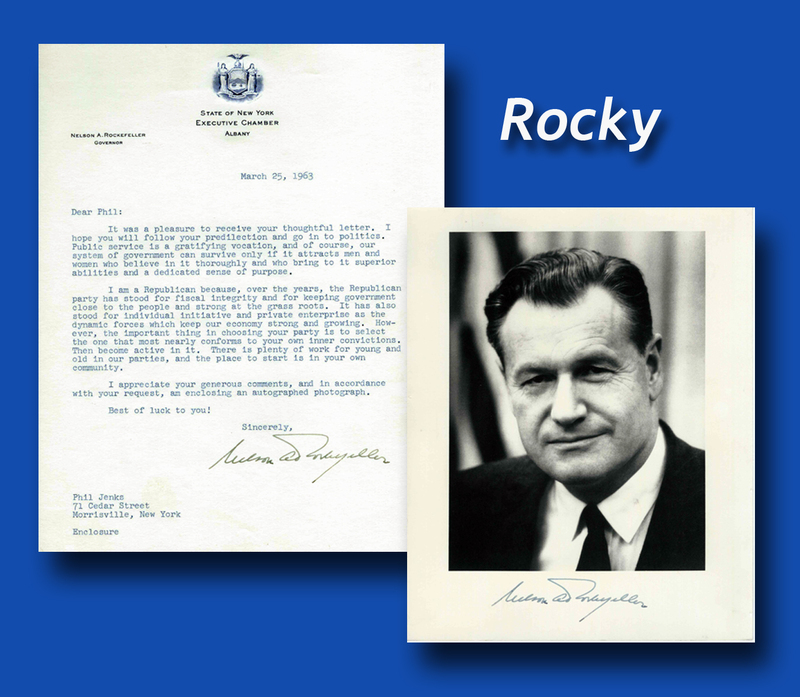 Rocky was a civil rights activist, an educator who dramatically expanded the State University of New York, a developer of low-income housing, a proponent of Medicaid and welfare, and an expander of state roadways, tunnels, and bridges. He was so liberal, in fact, that many people wondered why he wasn’t a Democrat. Eager to learn the answer, I pretended to be undecided about which party to embrace and wrote to the governor to ask him why he embraced the GOP. Rocky’s words may not have originated with him, and over the years I’ve noticed that his signature on the letter is precisely identical to the signature on the picture. It is likely the product of a sig-mac machine, not the governor’s hand, and governor may not have seen either document. After another decade had passed, the harsh Rockefeller Drug Laws and Rocky’s brutal assault on the Attica prison riot raised doubt if he was still a Rockefeller Republican. But in 1962 he was both popular and charismatic in New York State. That summer, my Dad was a counselor at New York’s Boys State held at Colgate University and he invited me to tag along and sit in the chapel balcony as Rocky addressed the boys. The boys stood and cheered lustily as the governor walked on the platform, and Rocky smiled broadly and waved both arms in response to the accolades. He made a brief speech about the importance of youth in government, and I was impressed. In many ways, I suspect Rocky was more liberal than my idol JFK, but like JFK he had a knack for saying what crowds wanted him to hear. One of the boys asked him what he thought about the Supreme Court’s recent decision to remove prayer from public schools, and he said, “I feel just as badly about it as you do.” But he added that the court’s decision was the law of the land. Nelson Rockefeller was on Richard Nixon’s short list to be named vice president when Spiro Agnew resigned in disgrace in 1973. If that had happened, Rocky would have become president when Nixon resigned in disgrace in 1974. Of course the nomination went to Jerry Ford, who did ask Rockefeller to become vice president in 1974. But Rocky did not appear happy in the powerless office and he declined re-nomination to the position when Ford ran for election in 1976. Rockefeller died January 26, 1979 at the age of 70. Today, there are probably more people who remember the circumstances of his passing than the accomplishments of his long career. Initial reports of his death said he had been in his office in Rockefeller Center working on a book about his art collection. It was quickly revealed that he had actually been in his 54th Street townhouse when he died, pursuing more strenuous activities with his 25-year-old aide Megan Marshack. The Rockefeller family did its best to obscure the actual circumstances of Rocky’s last hurrah. They refused to authorize an autopsy and issued statements absolving Marshack and others from accusations they delayed calling medics to revive him. The family also declined comment on New York Magazine’s suggestion for an epitaph: He thought he was coming, but he was going.